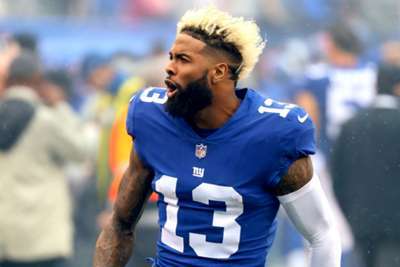 New York Giants wide receiver Odell Beckham Jr. has revealed he does not like water. Beckham, who made headlines after he left the field before half-time in the Giants' loss to the Philadelphia Eagles in Week 6, was asked about some of the problems he has been having with dehydration and responded with an unusual answer. "I really don't like water," he told reporters. "I'm trying. I really just don't like it. "You know when you get that stomach feeling and it's all slushy-feeling? I'm trying to stay hydrated but sometimes I just got to get an IV. It's just necessary. "You're cramping in both calves, it's hard to run and make cuts. And if you're cramping and dehydrated you're susceptible to something else. So, I'm trying to stay on top of it the best I can." Coach Pat Shurmur was then asked if it was news to him that Beckham does not like water. He added: "That's news to me, yeah. I mean listen, Odell and I and the players talk about a lot of things. We don't talk about our like and dislike for water."